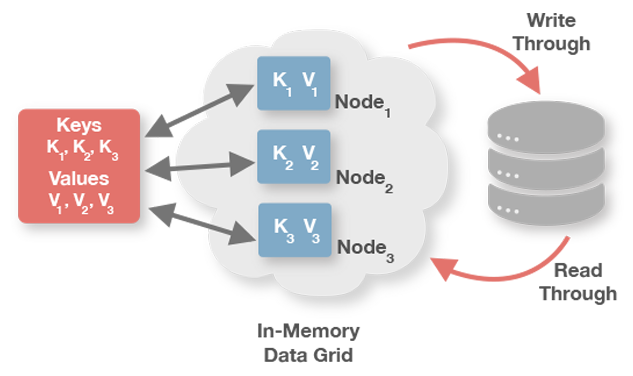 In the previous post about Apache Ignite, we learnt how to set up and create either a simple cache or a sql cache, and share the cached data between different nodes. In this post, we will dig a little deeper. We will see what to do if our app crashes because the cached data has disappeared. How could Ignite help us avoid this problem? Let’s suppose that we are working on a real-time IoT application, designed to receive events from devices such as temperature devices, GPS, or events from raspberry sensors. We assume that an event has organized data that is static like an event ID, metadata, lat-long coordinates for geospatial queries (shortest route maybe). A backoffice application also exists through which the users can create the devices metadata based on an unique ID (the same as the received events), like the imei, or gpio, etc. Sensors can send events every minute or even less, in the case of the GPS. We often come up against the requirement of enriching the dynamic data with the static data, with the advantage that the devices are usually waiting for the ack message. How can Apache Ignite help us with this situation? For example, with static data and dynamic data in multiple microservices? Besides using the cache benefits of Ignite as we have seen in the previous post (replication, repartition, queries), does Ignite have persistence with just the cached data? Let’s take a deeper look at this point. There are a variety of databases that are suitable for persist data, but how many in-memory platforms provide cache and storage without boilerplate code? Here is a simple example to show how it works (we will use Postgres as database, and Scala). "org.postgresql" % "postgresql" % "42.2.4"
In this section, we configure the cache backup nodes, cache mode, and expiration policy for the data. For an overview, check Partition and Replication on the previous post. Wait until the configured expiry policy time ends and try again to see the results. In-Memory Mode (data is stored solely in RAM): expired entries are purged from RAM completely. Memory + Ignite persistence: expired entries are removed from memory and disk tiers. Memory + 3rd party persistence: expired entries are just removed from the memory tier (Ignite) and the 3​rd party persistence (RDBMS, NoSQL, and other databases) is kept intact. As I mentioned above, the user can persist the devices metadata in a database. If this is the case, then our native persistence has been “pre loaded” as a database, and for each update, the application will update the database and refresh the associated value in the cache. If the cache always depends on a database, is there any possibility to associate the database actions to the cache? Perhaps. Does Ignite have a way to put/load data into/from the cache through a database? (Reminder: Postgres is the database). CacheStoreFactory is our 3rd party persistence layer where we can manage to access/read data from the database to/from Ignite. In our example, we will use mostly two of these methods: write and load. The write method, related to cacheCfg.setWriteThrough(true). Setting it as true, means putting a value into the cache but, under the hood, it is called the write method. If it is set to false, it’s never called write method. With this approach, our cache can always be updated! Depending on the case, reading or writing from the database is configurable. Besides these methods, cacheStore provides, delete and loadCache. Imagine, you can use postgres to save your app data, and maybe have a read only cache for our dashboard view, like in the example. Or even better: a write-only cache where you can put the data in cache+postgres and read it from the read-only cache. Ignite provides us with this powerful tool to be able to maintain our data in memory or in memory+native or in memory+nosql or in memory+jdbc. It is very flexible and can be adapted to our architectures. Is is possible to use this in a CQRS model? Big Data Architect at Stratio, passionate about distributed and concurrent applications, Akka fan, and mate addict. Good post!!! Question: Why don’t use memSQL as event store? You can write your own 3rd party persistence with nosql and sql databases. I didnt know memSql, but depends of your problem. Ignite gives you the possibility to use inside scala/java application,so you dont need extra infrastructure.